This guide was written by Sean Odom as an aid in training staff. However, it’s written in such a way to be helpful to anyone who needs a beginners overview of SEO. As sometimes you will be optimizing a website from scratch and sometimes you will be optimizing a website that is already built,our search engine optimization steps do not necessarily go in order. No site is the same, and every website will require that you focus on different aspects of search engine marketing depending on the specific site’s limitations and topic. If you are optimizing a site for a client, it is VITAL that the customer understands basic SEO processes and techniques that you will be doing. They will be integral in helping to choose keywords that are appropriate to their business. And only by understanding his industry will you be able to create a campaign that will send targeted leads to their site. What are organic search engine results? There are three kinds of results sets in a search result, Local maps, Organic and Sponsored Ads. Sponsored ads are usually at the top and are labeled "Ad or Ads." The local maps are normally above the organics in a set of 3 listings. Note: Local map listings can also be a blend of organic and map results. See our service information Local maps optimization. Organic search listings are determined by the search engines’ algorithms for finding, sorting and ranking pages based on relevancy. A pay per click (PPC) is a sponsored listing where the site’s owner pays every time the listing is clicked. The cost per click can range widely. Search engine optimization is the process of improving a websites visibility in organic search results using a variety of different strategies and techniques. Often starting with the planning user friendly UI design, optimizing navigation structure, clean coding, optimize Meta data, Schema usage, and content optimization. What do search engine robots see? What can you expect from search engine optimization? You can expect search engine optimization to be a lot of hard work. Once a website is search engine friendly and goes live, it takes a couple days to get crawled. After that, it can take several months for ranks to stabilize. You can expect the site to jump wildly into and out of results for the first several months. If it doesn’t, you’re lucky. During this time, you should continue to work on the website using the SEO guidelines outlined in this document. Eventually, when the site gains seniority and stability you will begin to see some payoff. You should not expect instant results from search engine optimization, although you will sometimes get lucky and get results sooner rather than later. There is no rhyme or reason to it. You can optimize ten websites using the exact same principles and one site will rank in 2 days and the next in 2 months. Search engines are fickle creatures. It can sometimes be frustrating when websites are being sluggish about ranking, but keep up your optimization and maintenance and trust that creating quality content and search engine friendly sites will pay off. A. Check Overall Site Design. If the site is in Flash you should also have a plain HTML version. If it’s in Frames you may want to consider a site redesign. Or if the website has more dynamically generated pages that use session ID’s than static HTML web pages, you may want to consider URL re-writes to more search engine friendly URL’s. Search engines simply do better with basic HTML web pages. Period. If you have a site in Flash or Frames and redesign is impossible or highly undesirable, you will need to consult an expert SEO or additional resources outside this guide. B. Double Check for Search Engine Compatibility with the Lynx Viewer. Go to the Delorie Lynx Viewer and view your page. This is how search engines see your web page. If the site is navigable, basically clean and understandable, has plenty of good text and can be seen in the Delorie Viewer, that’s a good sign. If it can’t be seen,there’s a good chance that search engines won’t be able to view the page either. search engine friendly). To see examples of what a Flash site looks like, see the Macromedia website show case. Frames – A website technique used by programmers so that each section of a website is actually a separate, sometimes scrollable region and each region is located in a separate file. Frames are generally considered obsolete, cause numerous design and SEO problems, and since the advent of SSIs, serve no real purpose. This website is in frames. C. Hosting. Make sure the site has a static IP. The benefit to having a static IP, is its yours and yours alone. Apposed to having a dynamic IP where you share one IP with many others. D. Domain Name. Do not try to capture the keywords in the domain name. Dashes and double dashes are just tacky, and they could indicate over-optimization to search engines. Choose a catchy, professional, easy to remember domain name. E. Cut Your File Size. The smaller the better. For search engines and for people. Under 80K to 100K is what most people can manage, but if you can get it under 10K or 15K that is even better. B. Anchor Text Optimization. Anchor text is another word for link text. Whenever possible, links that point to your site should contain the keyword variations, site name, etc., you have chosen for your site theme. Hence a link from your happy customer that reads "Pet Insurance ASTYTrust" is better than a link that reads "Pet Insurance ASTYTrust." This principal can be used within the site as well. 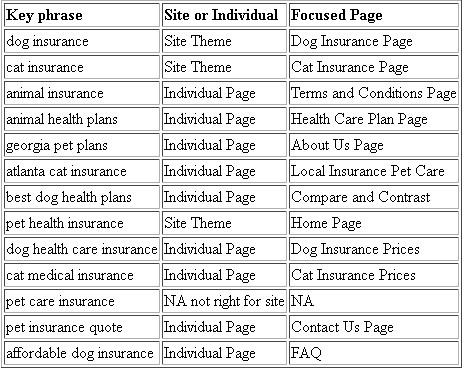 For in-site links, you will want the link from page A to page B to contain the keyword or phrase you have chosen as a focus for page c. Hence, using the Keyword Mapping for the Pet Insurance site above, a link from the Homepage to the Dog Insurance Page, should read dog insurance rather than canine services. C. File Names. Use keywords in your file names for pages and images without going overboard. Use hyphens between the words, not underscores. So, for example, you might name the Dog Insurance Page, dog-insurance.html, and a you may name a picture of a dog on the page, healthy-dog.jpg. Websites should be content rich, with keywords used appropriately throughout the content. Keep in mind that there’s no reason to go overboard and fill your content with to many keywords. Search engines can penalize a site for over-optimization of any kind, including excessive keyword usage in content. A. Plan For Extensive Content. Create a plan to have at least 50 pages of extensive, quality content within one year of your start date. This means real, quality content, not the same content rewritten 100 times. E. Themes and Categorization. Map out each word as "individual page" or "site theme." Search engines look at site themes, so the keywords should be scattered throughout the text on the website (if they do not already appear). However, on smaller, very targeted search phrases it is often a good idea to devote a whole web page centered around that key phrase. At this point you will want to categorize each key phrase you have chosen as "site theme" or "individual page." These will be the terms that you believe will bring you the most targeted traffic. This does not mean that you will not have individual web pages focused toward the site themes nor does it mean that you should not sprinkle keywords tagged for "individual pages" liberally throughout the site. This is for general guidelines and optimization organization. From now on we will use the term "Focus Key phrase" to mean a keyword or phrase chosen as the focus for that web page. G. Keyword Input. Once you have mapped each page to a keyword, make sure that that keyword appears in a variety of ways on the page. This is a good rule of thumb. There are also additional steps to individualizing a key term for a page" "behind the scenes". These steps appear in the META tags section. B. Use Keyword Suggestion Tools. C. Competitive & Market Analysis. 1. Go down your list and type in your most promising-looking keywords into Google or Yahoo. If your competition is showing up in the first web pages, you’ll probably want to rank under those keywords too. If your competition isn’t, that is also good to know, because you could capture a new keyword or phrase that they didn’t think about. Think of it like this: if you’re opening up a new McDonald’s you’ll want to know where the Burger Kings are. If there’s a thriving Burger King, chances are its a good spot to be. On the other hand, if there’s a new neighborhood, with no hamburger joint, you’ll definitely want to be the first one. List 2. 10-30 Primary Search Engine Optimization Terms. These are targeted search terms that will not pit you against the big guys, but will give you a great conversion rate. That is, people looking for these terms are looking for exactly what you do in one of your niche areas. You’ll want to include some of the search terms with mid and low popularity in the Overture and Wordtracker databases and some highly niche terms. For example you may include terms here like: “houston world war two veteran clubs,” or “white house spoon collectibles.” It may be true that there are very few people searching for these terms, but if someone does search for that term (and that is what you do) you are sure to make a sale. Obviously, you will want to mix highly niche terms with broader terms that have a mid to high search rate. But again, don’t waste your time going for the really big terms yet. Back-end optimization, particularly of META tags, can be incredibly overrated, and many people falsely claim it to be the only search engine process, but it is still very important to helping a site rank well in search results. A. Declare the Document Type. Directly after the document type there are four META NAME tags that should be included within the "HEAD" section of the web page. The HEAD section is not seen by website visitors and is used only for informational purposes by search engine spiders. The content of your web page goes here. Title Tags should be no longer that 60 characters characters and should include the focus key phrase for that page only once. Description Tags should be no longer that 150 characters and should include the focus key phrase for that page at the beginning or as close as possible. 4. Robots Tag: Use the robots.txt file to handle this stuff. D. ALT Text. Images have ALT text for people who have non-graphics browsers or for people who are visually challenged and must use a talking browser. Use your focused keywords or key phrases once (if applicable) in the ALT text of your images. But again, don’t go overboard. E. Validate Your Home Page. Validate your homepage at: http://validator.w3.org/. It’s actually better to validate every page, but validation can be extremely time consuming. You could easily spend half and hour to an hour validating each web page. Therefore, for starters validate only the homepage. If you are building a site from the ground up it is important that you validate the site template BEFORE you start pasting in all your content or you will make the same HTML mistakes over and over again, and it will be much harder to clean up later. There are many many tips to help in validation. Ask a senior SEO if (when) you run into problems. F. Clean Up Your Code. A. Inbound Links. In general the more links you have coming into your site from outside websites, the better. That being said, you could spend at eternity getting a million incoming links that only counted .000001% towards your site’s ranking. Links from pages that a) already have a lot of links and/or b) are completely irrelevant to your site’s content do not count towards your site’s ranking in search engines. Create a great site with useful content and people will naturally link to you. Make news. Write industry-related articles that you allow other people to put on their site in return for a backlink or for press releases and distribute them to free or paid press release services that will distribute your news and links across the web. B. Outbound Links. Your outbound links should link to quality, authoritative sites. Link outward when appropriate and choose wisely using keywords in your anchor text. Search engines care who you link to, and they do assume "birds of a feather flock together." So don’t link to just anyone, and don’t swap links with just anyone who asks. C. On Site Links. If you have great content, it should be easy to link well within your site. If you have a page about dog insurance prices, and another on the dog insurance policies and another on the dog insurance pros and cons, and another on dog insurance resources link between them within your content using your keywords in your anchor text. This not only helps your visitors, but helps search engines to see a "quality grouping" of related content. It is generally preferable for your text links to use your chosen keywords and phrases as anchor text. Hence search engine optimization guide is a better link than click here for our SEO guide. Plus, it looks better from a usability standpoint too. E. Use a Site Map. Search engines do look for these. A good site map will help the search engine spider to find all of your web pages. If the site does not yet have a site map, create one. For the top local citations check out or list here. For an updated list of the top SEO friendly web directories check or our General web directory list. Automated submissions. Do not use automated software to submit to search engines and directories. Content repetition. Some search engines use a "duplicate content filter." Do not duplicate your content or copy your content from another website (which would, of course, be immoral anyway). Joining link farms. Do not include your site in any "linking schemes" or link farms designed only to generate long lists of incoming links. A. Check your incoming logs. If you are getting several referrals for a niche topic. Write more on that topic. Obviously your visitors want that. And more or that will lead to more quality, targeted hits, which is what the point of search engine optimization is after all. B. Add content, add more content and add more content. Stagnant sites tend to loose search engines’ interest. If you want to get ranking with the big guys, you’ve got to keep up. Keep adding quality content and articles on your topic. Search engines and visitors both will be more likely to stay around. If you don’t have the time to write it yourself you can always hire a copywriter to help out with your website needs. C. Validation and HTML. Continue validating pages and cleaning your HTML starting with your top level pages and moving down. D. Submissions. Continue to find and submit to new directories and upkeep paid directories as necessary. Continue to look for appropriate topic specific directories. Check your submission list once every 6 months to a year and resubmit to directories that did not accept you. E. Linking. Continue to harvest quality, inbound links using tips outlined in Step 6. F. Keep up with changes. Search engines tweak, improve and change their algorithms often. Keep up with the changes. 1. Check the following Search Engine Optimization resources often. 2. Subscribe to the following Search Engine Optimization newsletters. You are free to use this document for private use, but reproduction of this document in online or print form with the intent to redistribute is strictly prohibited without explicit permission from SeOpt Internet Marketing. This document is Copyright 2004-2013 and Intellectual Property of Sean & Wintress Odom. Originally written and published by Sean Odom in May 2004. Sean is the founder of SeOpt Internet Marketing, a Houston based local search engine optimization service provider. Sean is also co-founder of Socialot.com, a SAAS social contact management system for small businesses.